Did monster black holes pull the first galaxies together, or were they born inside those galaxies? According to current theories, most large galaxies harbor supermassive black holes at their core. But When these galaxies collide and their black holes merge into one massive object, they yield no information about the original black holes. Astronomers at Cardiff University have been trying to look for gravitational waves. Gravitational waves are ripples in space and time, which were predicted by Einstein almost 100 years ago, but have not yet been directly detected. Gravitational waves are generated by accelerating masses, such as orbiting black holes, similar to the way accelerating electrical charges emit electromagnetic waves, like light, infra-red and radio waves — with the important difference that gravitational waves are far weaker. For this reason it is electromagnetic waves that have told us everything we have learnt about the cosmos since ancient times. According to Dr Mark Hannam from the Cardiff School of Physics and Astronomy, "If we could also detect gravitational waves, that would push open a new window on the universe, and tell us about its dark side". General relativity predicts that colliding black holes should emit such ripples in the fabric of space-time, including a wave called the ringdown that contains information about the final black hole's mass and spin. 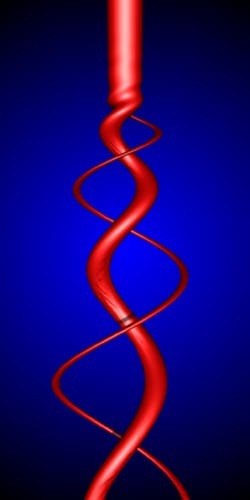 Computer simulations led by Kamaretsos show that the ringdown can also tell us the masses and spins of the two original black holes. The team of researchers is using more than 1900 computer processors for one year to solve the equations of Einstein's general theory of relativity, to describe what happens when two black holes collide. The ultimate goal of the simulations is the direct observation of black-hole collisions through the gravitational-wave signals that they emit. The research team comprised more than 20 physicists working at Cardiff, the Universities of Jena, Vienna, and the Balearic Islands, the Albert Einstein Institute in Potsdam, and the California Institute of Technology. Solving Einstein's equations on supercomputers to accurately describe black holes became possible only after a series of breakthroughs in 2005, and the mostly young researchers are excited to be part of a scientific revolution. "The detectors are pushing against the limits of current technology, and now we will help them with simulations that are at the cutting edge of computing power," says Dr Hannam. Some current theories say the gravity of the black holes of the early universe pulled matter together to form the first galaxies. It remains a mystery. however, if the earliest black holes were massive enough to do this. The largest known black hole exists at the center of the super giant elliptical galaxy M87 in cluster Virgo fifty million light-years away is the most massive black hole for which a precise mass has been measured -6.6 billion solar masses. Orbiting the galaxy is an abnormally large population of about 12,000 globular clusters, compared to 150-200 globular clusters orbiting the Milky Way. The image at the top of the page shows the supermassive black hole at the center of our Milky Way galaxy. 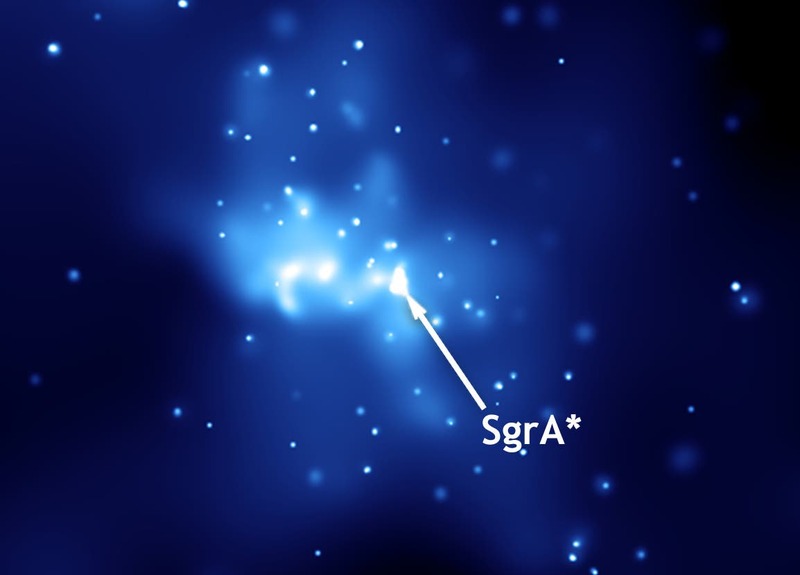 The massive black hole inside Saggitarious A* is invisible, but it is there, regulating star formation at the heart of the galaxy and slowly growing in size through the millennia. Will it eventually stop growing, or will this massive black hole gradually consume the entire galaxy? In the far, far future, will space travelers who (accidentally) find themselves at the center of the former large spiral galaxy called the Milky Way see nothing but wisps of interstellar gas? As they closely approach the galactic center, the outline of the giant black hole will become visible because of the violent atomic activity just beyond the boundary where matter is sucked in forever. "Help Us Bring the Cosmos to Life!" Become a Founding Contributor to the New Frontier in Internet Radio. Take Your Pre-Launch Video Tour of Daily Galaxy Radio and Subscribe Today.